← Curiosity & Transition: Are these related? “I want to go with crazy good,” said Sal, an animated presenter at a meeting at my children’s school a few nights ago. By crazy good I interpreted him to mean a ‘good’ outcome juiced up with steroids to make it an ‘exceptionally’ good outcome. “I am always trying to think about the ‘stretch’….use my imagination to think bigger,” said the authentic youth leader as he was trying to engage a desperately tired audience of parents. “Why not?” he posed. Sal was imploring his audience to question the set of assumptions that we bring to our everyday existence; the filters that may cause us to tamp down things like personal goals or desired outcomes or, better yet, how much of ourselves we invest in a situation. Sal’s comments came screeching to mind today as I read Why I Am Leaving Goldman Sachs, an Op-Ed piece of The New York Times authored by exiting Goldman Sachs Executive Director, Greg Smith. The piece is a well-written lament about the loss of the firm’s soul due to a re-ordering of priorities. From Smith’s perspective it seems that Goldman Sachs has put ‘making money’ ahead of the ‘client good’ via a systematic and troubling set of actions. He goes into many details that would entertain anyone who has a history with Goldman; former employees, clients, regulators, and competitors. Was this guy going for crazy good? At one level I think he was. Behind his remarks it is clear that Mr. Smith is truly in love with the Goldman of yore. Through this lens his piece can be viewed as a desperate attempt to right a ship that he’s nurtured for more than a decade. A public plea to get someone upstairs to listen. Even clients? Despite his potential altruism his venue choice and transparency could be described as a kamikaze approach to transition. In Novofemina’s Summer Book Review #2 William Bridges defined the transition process as “an ‘ending’; followed by a ’empty zone’ or ‘neutrality’; followed by a ‘beginning’. Bridges introduces that in “transition” or “ending” we break our connection with the setting in which we have come to know ourselves. (Transitions, Bridges, pg 128) Smith is well down the garden path to breaking his connections…..
Has Mr. Smith set a new standard for anchoring a transition? Who among us wouldn’t love to have the Times graciously print our analysis of a former employer? Want to read a few things into the record? How does a global readership of roughly one million sound? I’m all for anchoring the beginning of the transition process, Smith-style or not. My transition started with a triggering event almost a year prior to my actual departure from my former employer. While there were plenty of airline miles logged and 60+ hour weeks in the intervening twelve months I can cite that event as a point in time that initiated substantial change. An anchor of sorts for me. Can you articulate an anchor for your transition process? An anchor is immobile. An irrefutable point in time from which all progress can be measured. It demands authenticity. I think Sal was going for authenticity when he was imploring us with ‘crazy good.’ If you check yourself at the door and just carry-on…you may end up losing years or a decade like Mr. Smith describes. Sal has appeared at Novofemina before in Analogy: a powerful transition tool. Long time readers may remember him as the light switch guy. You see he hosts an annual off-site for local teens. At the conclusion of the event he gives each participant a ‘raw’ light switch. By ‘raw’ I mean just picked out of the bin at Home Depot. Wires hanging out. Electric and metal components all visible. With the switch Sal reminds teens that the decision is theirs; they can either choose to turn it on or leave it off. To jump in large into life or just hang back. I hope you choose to turn on the switch – Smith-style or otherwise. Your transition can only benefit from crazy good aspirations. 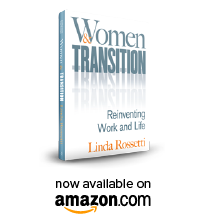 This entry was posted in Observations on Transition and tagged career transition, Goldman Sachs, Greg Smith, New Tork Times Why I am Leaving Goldman Sachs, observations from a women's transition, personal transition, Transitions Making Sense of LIfe's Changes, William Bridges, women's transition issues. Bookmark the permalink.